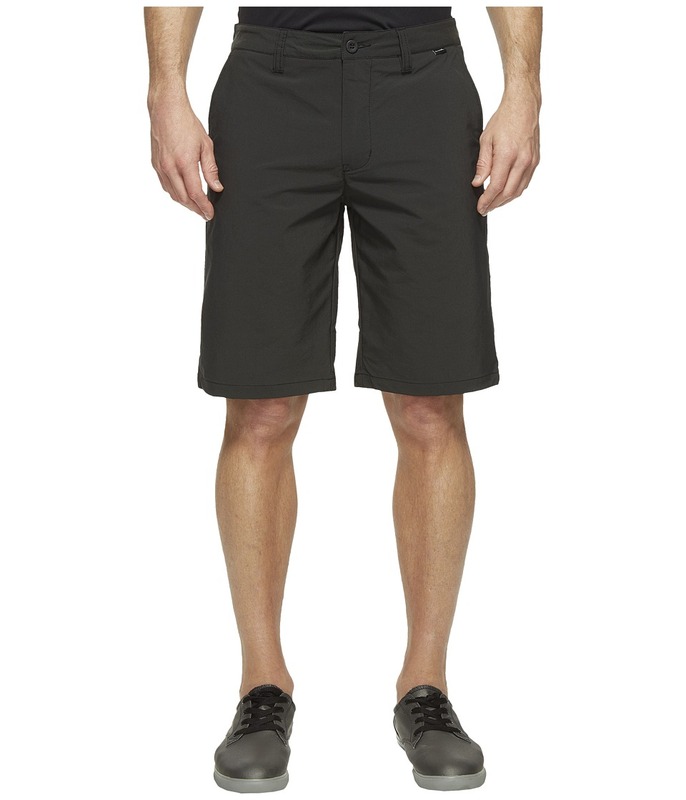 Don the Travis Mathew Hefner Short before your round and go charm the golf course like you would a sophisticated lady. Stretch fabric blend provides for the comfort you need. Belt loop waist. Buttoned front closure with zip fly. Side hand pockets. Back patch pockets. Travis Mathew Icon logo embroidery at left leg. Additional logo hits at front left waist and back right pocket. 53 percent nylon, 42 percent polyester, 5 percent spandex. Machine wash cold, tumble dry low. Imported. Measurements: Waist Measurement: 32 in Outseam: 21 in Inseam: 10 in Front Rise: 11 in Back Rise: 16 in Leg Opening: 22 in Product measurements were taken using size 32, inseam 10. Please note that measurements may vary by size. Need a getaway? 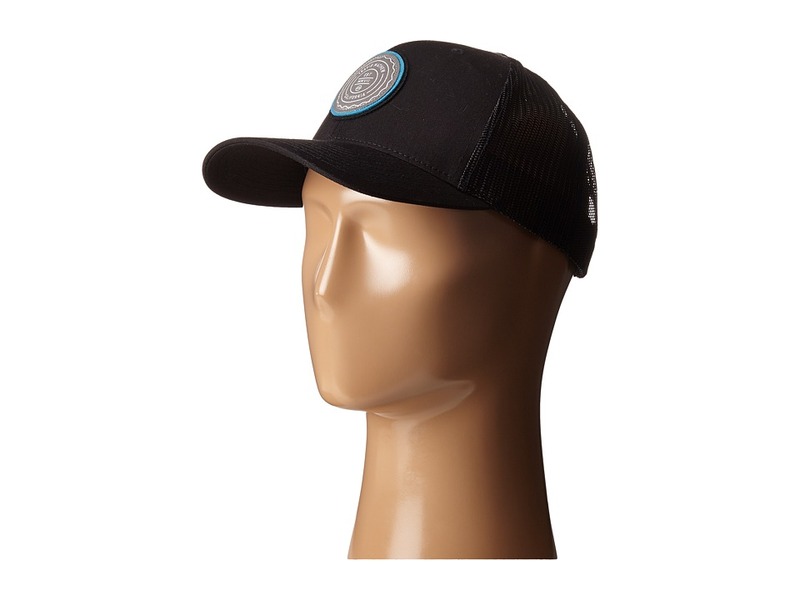 Grab this great hat from Travis Mathew&amp#8482 and hit the links for a vacation from the rat race. 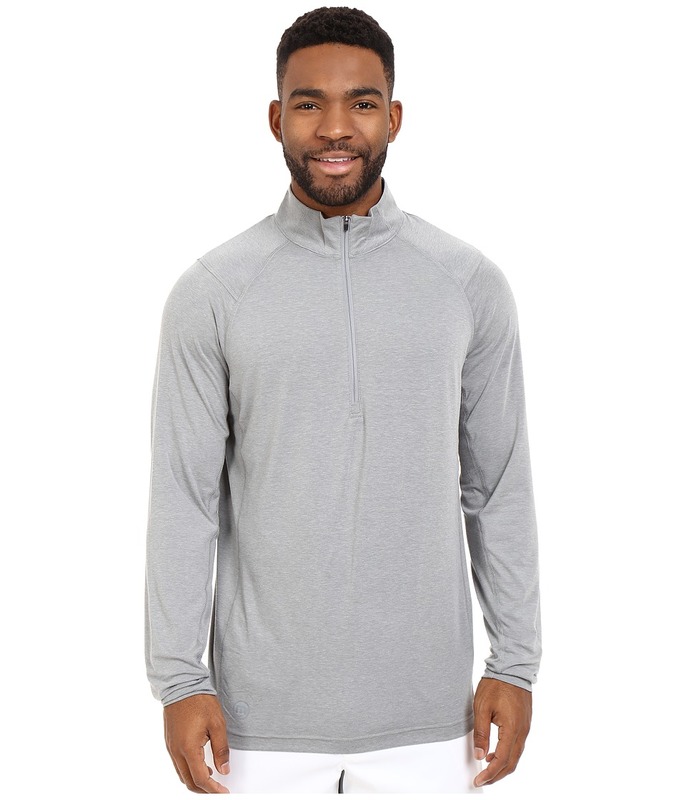 Stretchy Flexfit&amp#8482 design ensures that you receive a great fit. Classic six-panel construction. 3D TM icon embroidery at front. Travis Mathew script brandmarking at back. Pre-curved bill. 100 percent polyester. Imported. Measurements: Circumference: 21 1 2 in Brim: 3 in Product measurements were taken using size S/M. Please note that measurements may vary by size. Stop worrying and learn to love the driver. Comfortable, stretch fabric blend. Stand collar. Zippered front placket. Long raglan sleeves with banded cuffs. Travis Mathew logos at left chest and beneath back collar. Banded hem. 58 percent cotton, 32 percent polyester, 10 percent spandex. Machine wash cold, tumble dry low. Imported. Measurements: Length: 30 in Product measurements were taken using size MD. Please note that measurements may vary by size. 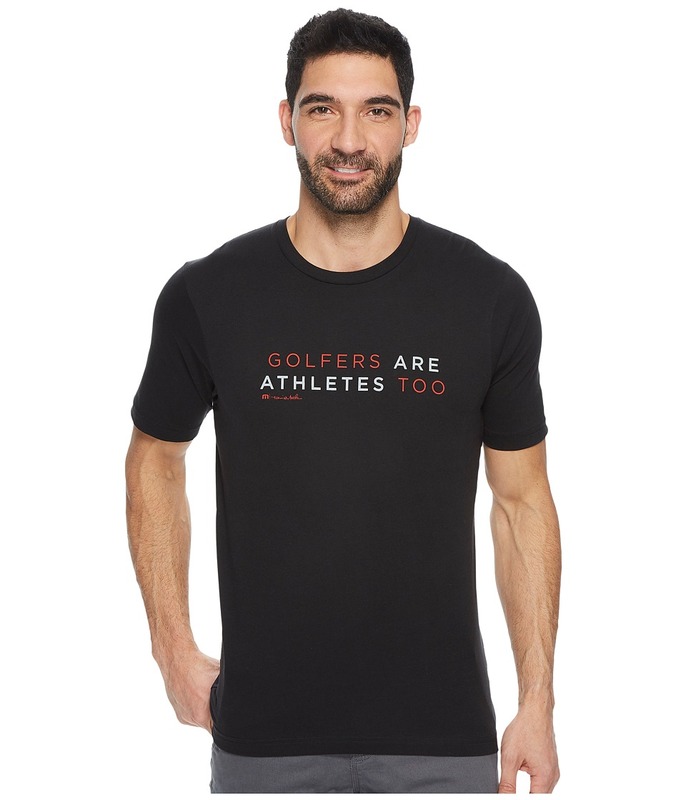 Have a little fun in the Travis Mathew Mapes Tee. Soft pima cotton provides for a superb wear. Funny screen printed graphic on front. Ribbed crew neck. Short sleeves. Straight hem. 100 percent pima cotton. Machine wash cold, tumble dry low. Imported. Measurements: Length: 30 in Product measurements were taken using size MD. Please note that measurements may vary by size. Sorry, not sorry. Comfortable pima cotton blend. Travis Mathew Sorry For Being Awesome!! print on front. Ribbed crew neck. Short sleeves. Straight hem. 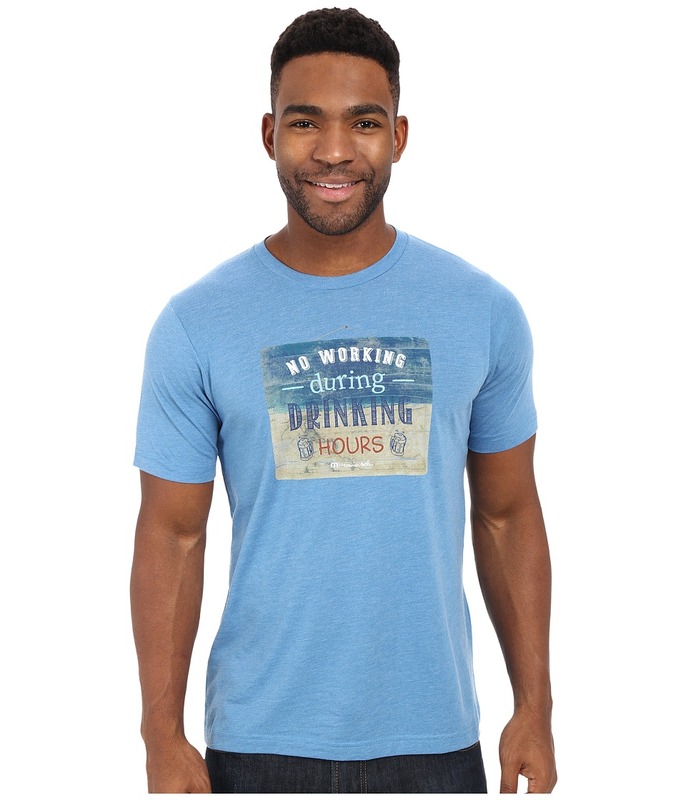 60 percent pima cotton, 40 percent polyester. Machine wash cold, tumble dry low. Imported. Measurements: Length: 29 in Product measurements were taken using size MD. Please note that measurements may vary by size. Mind the signs, and always follow the rules. Prestige 7 fabric offers a premium hand feel with wrinkle-resistant capabilities and enhanced breathability. Crew neck. Short sleeves. Straight hem. 50 percent cotton, 50 percent polyester. Machine wash cold, tumble dry low. Imported. Measurements: Length: 27 in Product measurements were taken using size MD. Please note that measurements may vary by size. 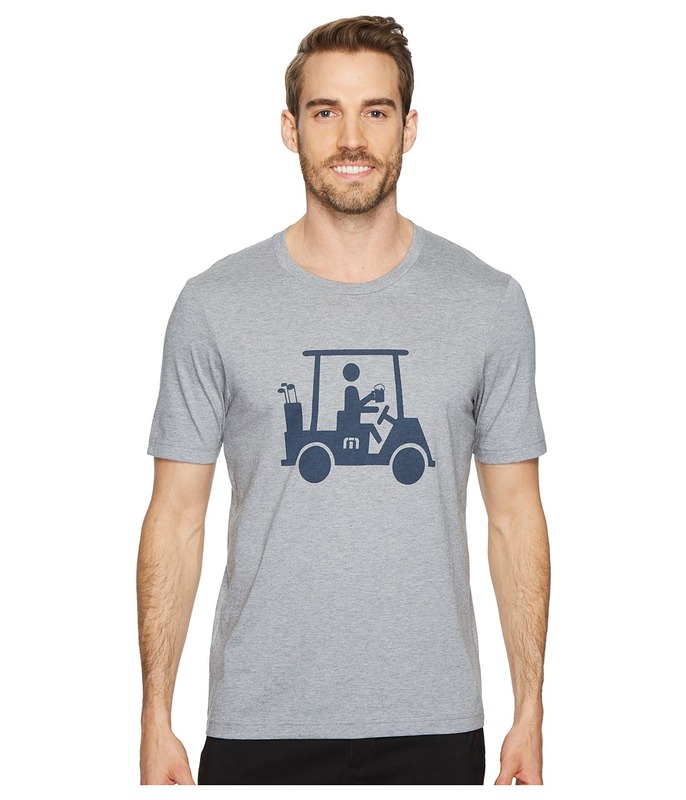 Sport this TravisMathew shirt when you~re hittin~ the links for a casual round of golf. 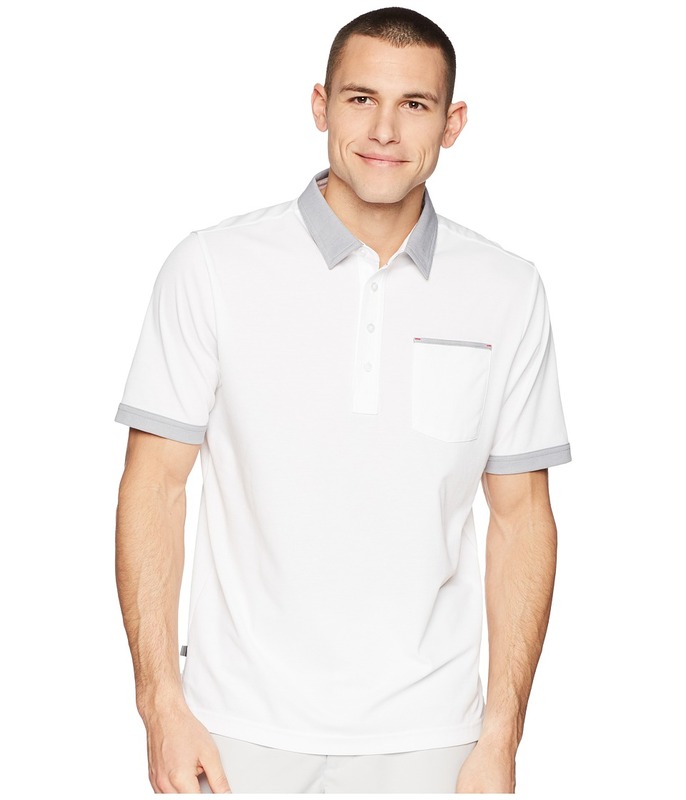 Prestige 7 heathered fabric offers a premium hand feel with wrinkle-resistant capabilities and enhanced breathability. Large brand graphic emblazoned at chest. Rib-knit crew neck. Short sleeves. Straight hem. 50 percent cotton, 50 percent polyester. Machine wash cold, tumble dry low. Imported. Measurements: Length: 28 in Product measurements were taken using size MD. Please note that measurements may vary by size. Layer up in classic style the next time you hit the links. Semi-fitted cut follows the contours of the body. Lightweight stretch blend offers enhanced mobility and all-day comfort. Flatlock stitching for reduced chafing and irritation. Stand collar. Zippered placket. Long raglan sleeves. Tonal brand embroidery at nape. Straight hem. 74 percent polyester, 19 percent cotton, 7 percent spandex. Machine wash cold, tumble dry low. Imported. Measurements: Length: 30 in Product measurements were taken using size MD. Please note that measurements may vary by size. 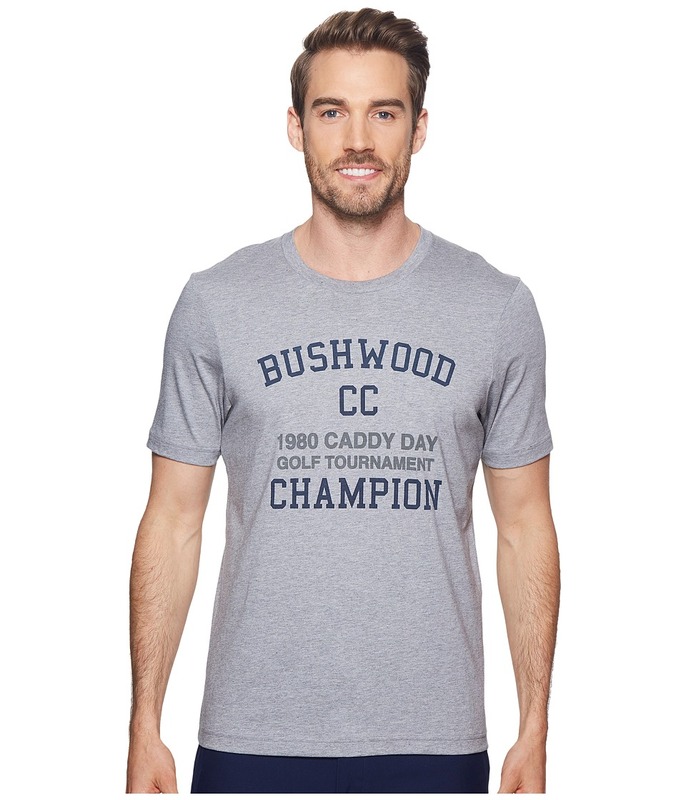 Celebrate those who have literally been by your side through the entire 18 holes! Prestige 7 fabric offers a premium hand feel with wrinkle-resistant capabilities and enhanced breathability. Brand text printed at front. TravisMathew signature Bottle Opener Patch sewn at inner hem so you can twist-off caps without a fret. Crew neck. Short sleeves. Straight hem. 100 percent pima cotton. Machine wash, tumble dry. Imported. Measurements: Length: 29 in Product measurements were taken using size MD. Please note that measurements may vary by size. Keep the competition struggling for bogeys in the Zim Polo. Prestige 77 fabric: &amp#8226 Wrinkle resistant. &amp#8226 Quick-drying and moisture-wicking. &amp#8226 Anti-odor capabilities that keep you fresh. &amp#8226 Four-way stretch for an enhanced range of motion. Fold-down collar. Three-button placket. Short sleeves. 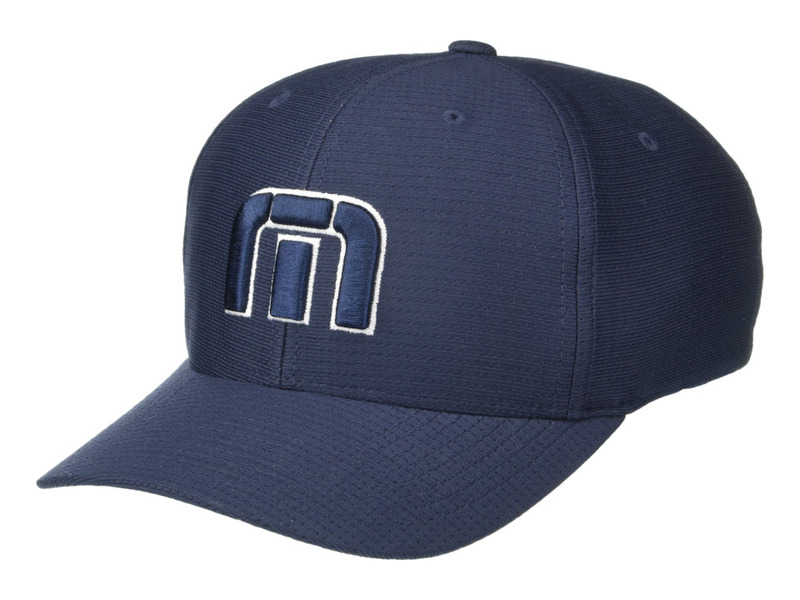 Brand logo embroidered at left chest. Straight hem with vented sides. 92 percent polyester, 8 percent elastane. Machine wash, tumble dry. Imported. Measurements: Length: 31 in Product measurements were taken using size MD. Please note that measurements may vary by size. 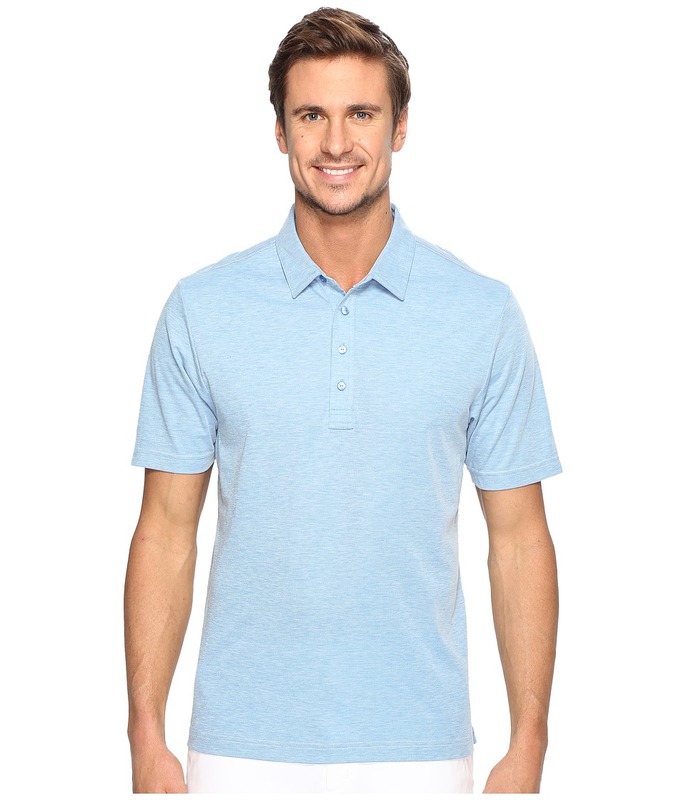 Hear those birdies chirpin~ in this stylish, high-performance polo. Prestige 77 fabric: &amp#8226 Wrinkle resistant. &amp#8226 Quick-drying and moisture-wicking. &amp#8226 Anti-odor capabilities that keep you fresh. &amp#8226 Four-way stretch for an enhanced range of motion. Fold-down collar. Four-button placket. Short sleeves. Left chest pocket. Straight hem. 57 percent pima cotton, 43 percent polyester. Machine wash, tumble dry. Imported. Measurements: Length: 30 in Product measurements were taken using size MD. Please note that measurements may vary by size. Your competition will be phoning home once you leave them swinging from the sandtraps in the Phone Home Tee. Prestige 7 fabric offers a premium hand feel with wrinkle-resistant capabilities and enhanced breathability. Brand graphic printed at chest. Rib-knit crew neck. Short sleeves. Straight hem. 50 percent cotton, 50 percent polyester. Machine wash, tumble dry. Imported. Measurements: Length: 29 in Product measurements were taken using size MD. Please note that measurements may vary by size. Cold weather has your fashion sense hittin~ a wall? Throw on this stylish, sleek sweater and never miss a round. 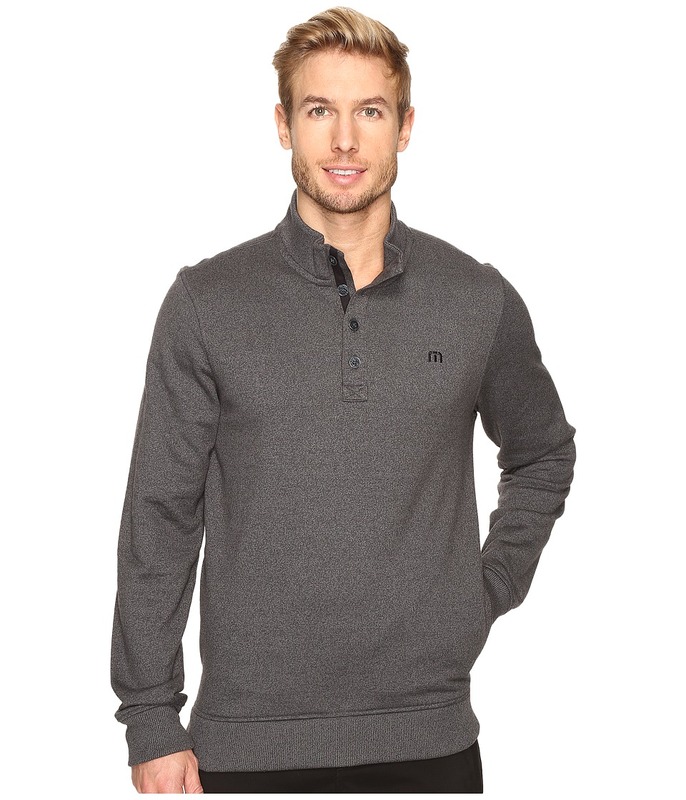 Super-soft fleece fabrication for all-day comfort and warmth. Stand collar provides added coverage. Three-button placket. Long sleeves. 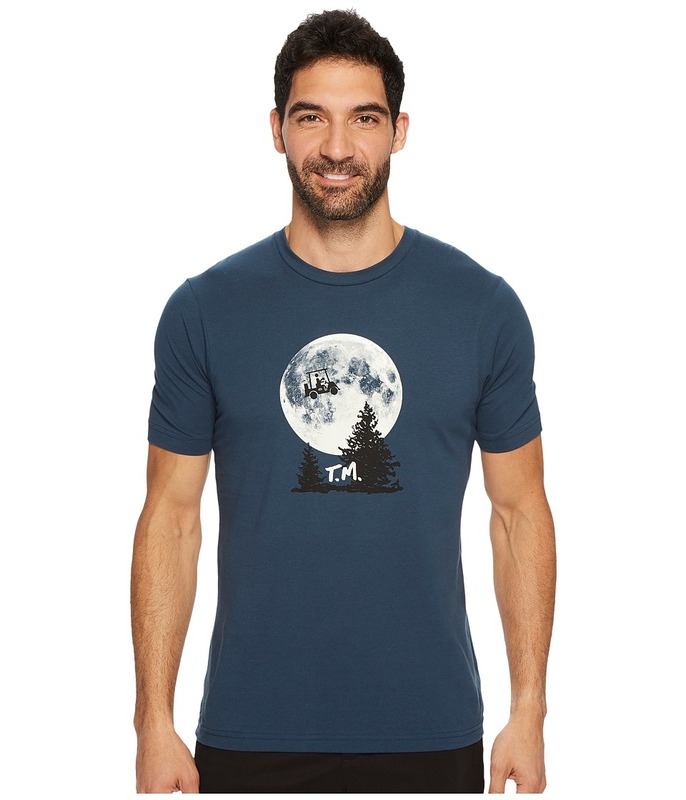 TM logo at left chest. Straight hem. 67 percent cotton, 33 percent polyester. Machine wash, tumble dry. Imported. Measurements: Length: 30 in Product measurements were taken using size MD. Please note that measurements may vary by size. 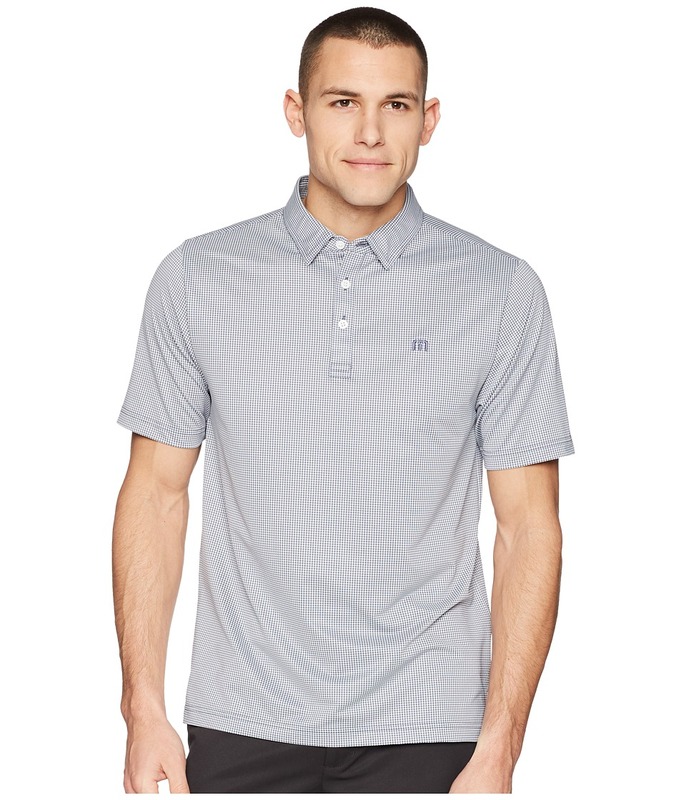 Stay king of the clubhouse in the high-performance Ten Year Golf Polo. 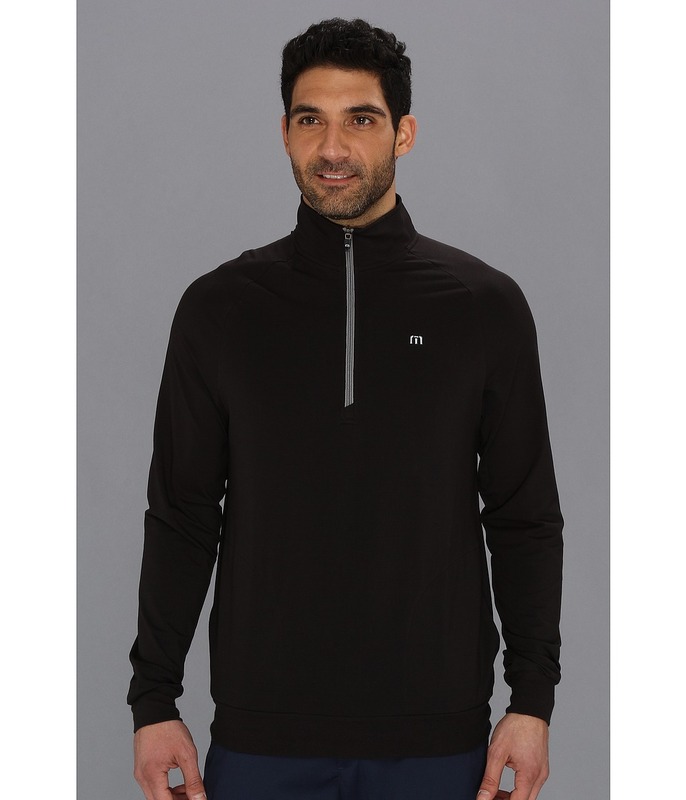 Prestige 77 Casual Performance fabric: &amp#8226 Wrinkle resistant. &amp#8226 Quick-drying and moisture-wicking. &amp#8226 Anti-odor capabilities that keep you fresh. &amp#8226 Four-way stretch for an enhanced range of motion. Fold-down collar. Four-button placket. Short sleeves. Straight hem with vented sides. 57 percent pima cotton, 43 percent polyester. Machine wash, tumble dry. Imported. Measurements: Length: 30 1 2 in Product measurements were taken using size MD. Please note that measurements may vary by size. 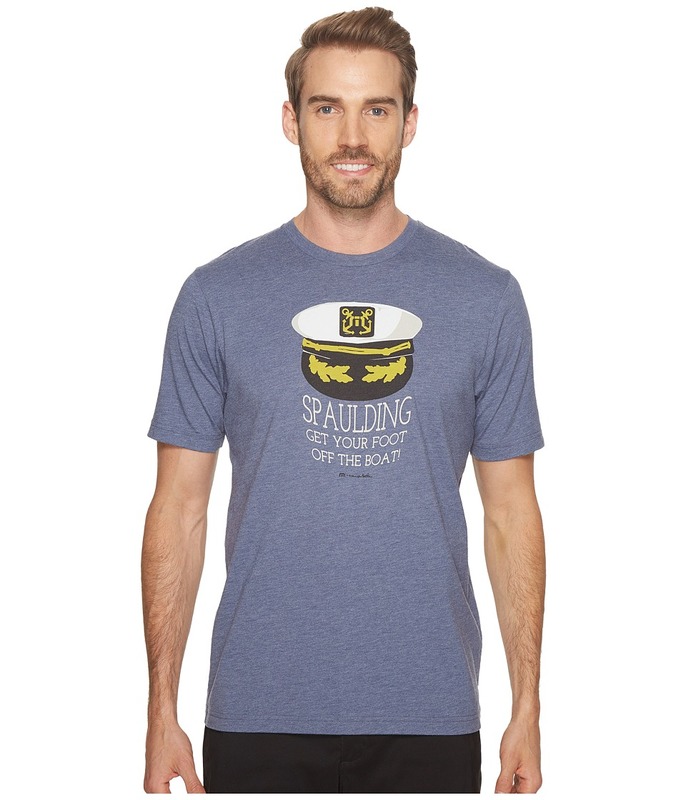 Be bold and courageous while you are in the Otters Polo! Prestige 777 fabric: &amp#8226 Ultra-lightweight construction. &amp#8226 Wrinkle resistant. &amp#8226 Quick-drying and moisture-wicking. &amp#8226 Four-way stretch for an enhanced range of motion. 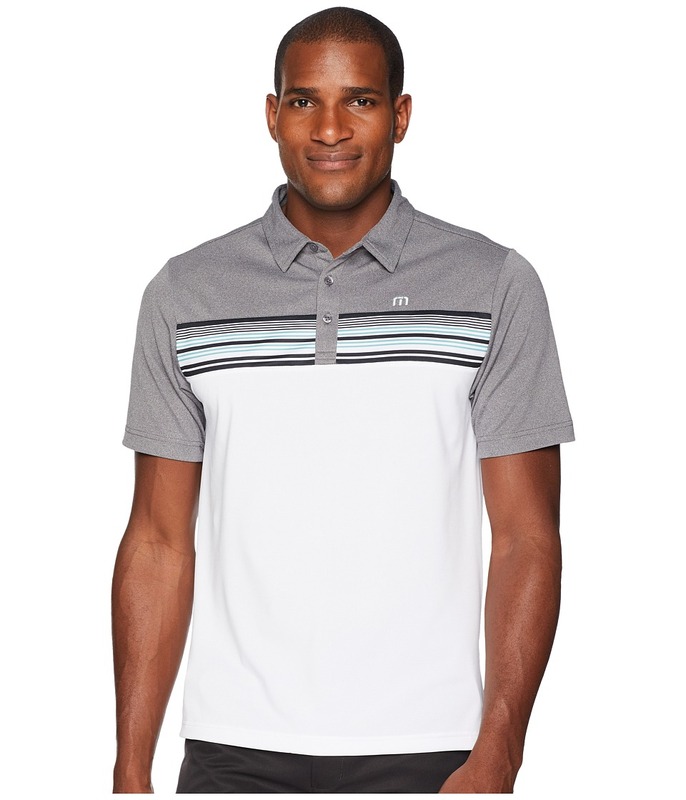 Signature TravisMathew collar stay technology adds a clean-cut finish to your swagger. Color-blocked design with a striped panel at center chest. Fold-down collar. Three-button placket. Short sleeves. Straight hemline. Embroidered logo hit at left chest and brand script at back neck. 96 percent polyester, 4 percent elastane. Machine wash, tumble dry. Imported. Measurements: Length: 31 in Product measurements were taken using size MD. Please note that measurements may vary by size. 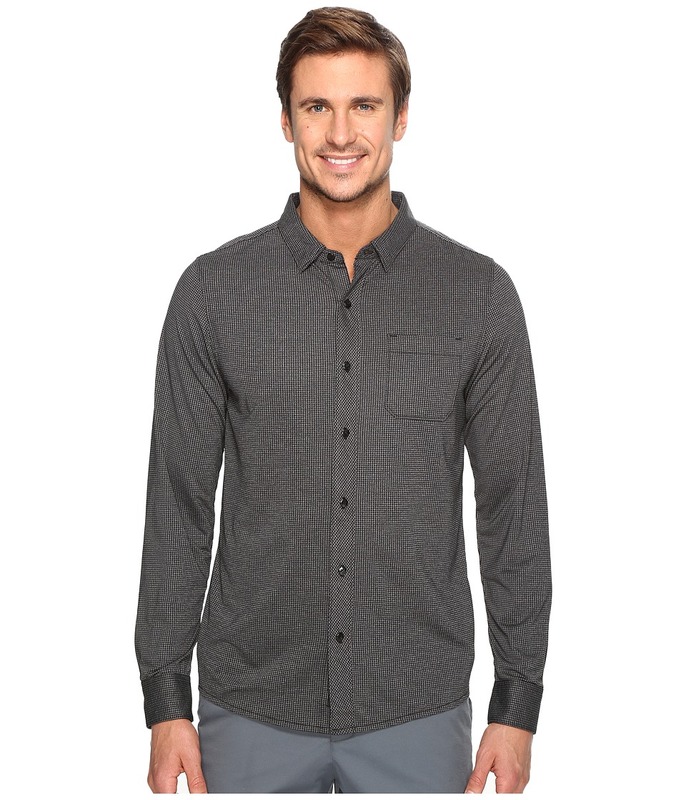 Maintain clean-cut style from the green to the clubhouse happy hour in the Couig Woven Shirt. Lightweight stretch fabrication offers all-day comfort and increased mobility. Fold-down collar. Button-up front closure. Long sleeves with single-button cuffs. Left chest pocket. Shirttail hem. 92 percent polyester, 8 percent elastane. Machine wash, tumble dry. Imported. Measurements: Length: 32 1 10 in Product measurements were taken using size MD. Please note that measurements may vary by size. 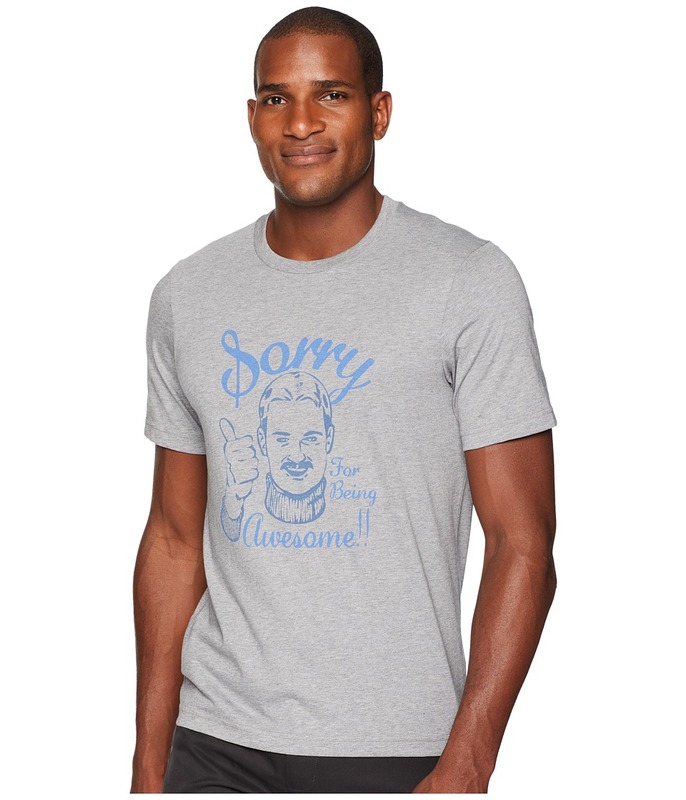 Take a stand and defend your ground in the stylish Ted Tee. Prestige 7 fabric offers a premium hand feel with wrinkle-resistant capabilities and enhanced breathability. A very-true statement printed at chest. Crew neck. Short sleeves. Straight hem. 100 percent cotton. Machine wash, tumble dry. Imported. Measurements: Length: 28 in Product measurements were taken using size MD. Please note that measurements may vary by size.